Colorado's loud public battle over fracking goes before the state Supreme Court on Wednesday when the justices hear arguments about whether local governments can ban the technique. Fracking, or hydraulic fracturing, helped set off an energy boom in Colorado. It also stirred up a fight over the potential dangers to the environment, public health and property values. Two cases are before the Supreme Court on Wednesday: a ban on fracking in Longmont and a five-year moratorium in Fort Collins. The oil and gas industry sued both cities and won in the lower courts. Whatever the Supreme Court decides, it probably won't be the final word. Fracking critics are also asking voters and state regulators to rein in the oil and gas industry and could take the fight to the Legislature. 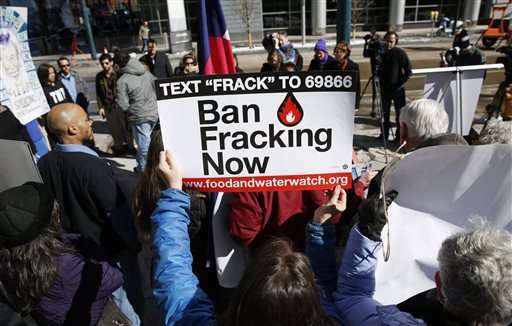 Fracking injects a high-pressure mix of water, sand and chemicals to break open underground formations. Combined with other drilling techniques, it opened up previously inaccessible oil and gas reserves, boosting Colorado's economy. The industry says it's safe, but critics worry about danger to the environment and public health from spills and leaks. Others say around-the-clock noise, lights and fumes from drilling rigs make their homes unlivable as oilfields overlap with growing communities. Longmont voters banned fracking inside the city in 2012, and Fort Collins voters approved a five-year moratorium in 2013. The Colorado Oil and Gas Association sued, and lower courts threw out the bans. Both cities appealed, and the Supreme Court will listen to oral arguments on Wednesday. Oil and gas have traditionally been regulated only by state government in Colorado, but Longmont, Fort Collins and other local governments are challenging that. Energy companies prefer state control—it means they have only one set of rules to worry about, and state law says regulators' job is to foster energy development, not prevent it. The Supreme Court probably won't reach a decision for weeks or months, and even then it might not be a definitive ruling. The justices could send one or both cases back to the lower courts to reconsider. If that happens, the question would wind up before the Supreme Court again sometime later. The Supreme Court isn't the only place Colorado's fracking war is being fought. The industry is putting up a stiff fight before the Oil and Gas Conservation Commission, the state's rule-making agency, over proposals to give local governments a consulting role but not veto power on drilling sites. A group called Coloradans for Community Rights wants to put a constitutional amendment on the 2016 ballot that would give local governments the right to regulate oil and gas, which is sure to bring a powerful counter-campaign from the industry. Another group, 350 Colorado, wants the Legislature to replace the Oil and Gas Conservation Commission with two agencies, one to protect residents from the effects of oil and gas and another to encourage renewable energy.